Across the world, the demand for electricity shifts dramatically between day to night. During peak hours — typically in the morning and evening — people use way more energy. To meet those high demands, utility companies have to find ways to store energy temporarily. Now, Switzerland- and California-based company Energy Vault may have a solution to that problem that wouldn’t incur massive costs for complex battery farms like Tesla’s Powerpack facilities. 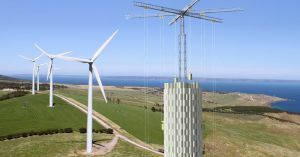 Their solution is essentially a 35-story tower that lifts a series of 35 metric ton bricks when energy requirements are low, then drops them back to the ground — capturing the kinetic energy with a generator in the process — when energy requirements are high. It’s a clever and simple solution. It works in a similar way to a hydro plant that pumps water up a hill during off-peak hoursand releases it back down during peak hours. The big advantage: no dam, hill, or river required. And that’s not the only advantage. No dams also means no harmful environmental factors. The bricks are even made out of landfill materials, reducing costs and environmental impact even further, according to Fast Company. Energy Vault’s first customer is Tata Power, an Indian electric utility. So far, only a small 72-foot (22 meter) prototype (shown in video above) exists near the company’s headquarters. The proposed designs are more than five times as tall. As global populations keep growing, their energy consumption does too. And more often than not, the environment suffers in the process of meeting those demands. But solutions like Energy Vault’s goes to show that it doesn’t have to be that way. More on storing energy: Can Molten Salt Make 24-Hour Solar Energy Possible?